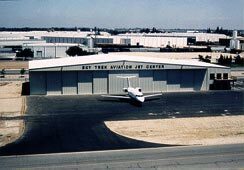 Aviation Facilities: Aircraft hangars are individually engineered to meet specific requirements and are flexible enough to satisfy even the most complex aviation need. The hangars may be designed using gable symmetrical, gable unsymmetrical or single slope structural systems. Useage: Clear span design provides column-free interiors for wide open floor space and eave heights that can accommodate today’s larger aircraft. The structures allow for a variety of door options including bi-fold, bi-parting and stack leaf designs. Note: We have pioneered the use of extra wide clear-span structures to handle today’s largest jet aircraft fleet.